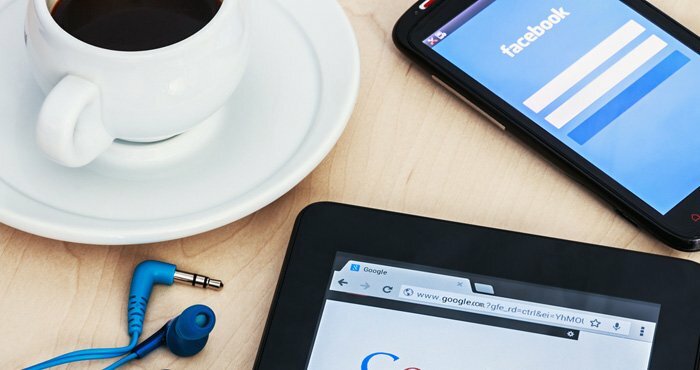 Should You Use Facebook or Google to Log In to Other Sites? We're all used to seeing "Log in with Facebook" or "Log in with Google" at sites around the Internet — or less frequently, an offer to log in with Twitter, LinkedIn or Pinterest. It's a common option at news sites like CNN.com and the UK's Guardian newspaper, music streaming services such as Spotify and tens of thousands of other online retailers, apps and games. Logging in with a main account whose credentials you easily remember saves you the trouble of going through yet another laborious account creation and memorizing dozens of passwords. It allows you to easily post about something you've just read or bought. But what exactly are you signing up for? Logging in to a website using a service such as Facebook or Google allows the website to make a request for data about you. Facebook and LinkedIn have quite a lot of data available for request: your birthday, friends list, email address, employment, colleges attended, photos and information that your friends have posted about you (for example, tagged photos). Other services like Twitter don't possess the same level of personal data about its users and aren't able to turn over as much information. The exact data that the website is requesting pops up in a window asking for permission. Saying yes to that request adds one more tiny bridge between the virtual islands of your online self. This seemingly small agreement can carry larger repercussions. Linking two or more sites allows companies to collect more data, building an increasingly rounded profile about you. Allowing one account to have access to others means that if the least secure account is hacked, the rest could also be compromised. Facebook and Google are by far the two most frequently used services for logging in to other sites. Facebook snared 62% of all social log-ins across the tens of thousands of sites that support it (as of the end of 2015); Google is used 24% of the time according to Gigya, a customer identity management company. Social networks want to be a trusted source for verifying your identify. In fact, at the Facebook developers conference this year, the company announced a service called Delegated Account Recovery, which would let you use Facebook to verify your identity if you forget your password on an app or website. Yet social networks don't inherently have value as a trusted source of identity. Privacy is not the main concern of a social network; like any for-profit company, its focus is on monetizing its product. We are the product. Take Facebook; according the eMarketer, Facebook is expected to generate $16.33 billion in net digital ad revenue in the U.S. market this year and Google is expected to generate $5.24 billion in display ads in the U.S. The data held by social platforms and service providers like Google covers your habits and preferences. Facebook Like buttons littered throughout the Internet bounce back data about products or articles you've liked, while the Facebook Open Graph platform for other sites comes with plug-ins that collect data such as which of your friends already use a particular website or what you do while on the site. 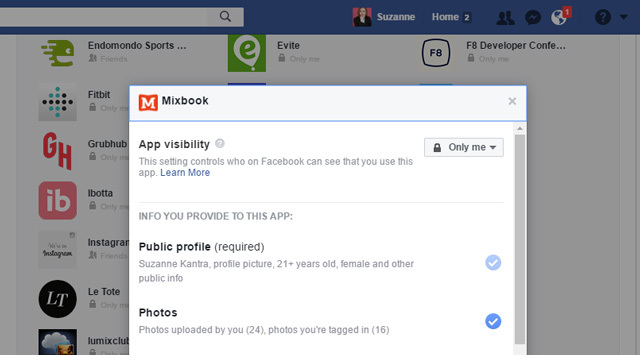 In response to privacy concerns, Facebook does allow you to log in to third-party apps without having to give permission to share personal details like your name, email, birthday and so forth. Make sure you sever the connection for apps you're not longer using. You can do that by going to Facebook Settings (click on the down arrow next to the question mark in the upper right) and select Apps. On that page you can click on any app and see the information the app has access to and can change those access privileges. Google tracks your online habits through search queries, its Chrome browser and more, building demographic profiles it then sells to companies who want to buy advertising on Google products, from Gmail sidebar ads to sponsored search results. The more data ecosystems that are connected, the more a company can know about us and the more we continue be their product, helping to maximize their profits. The social log-in is another way of adding data ecosystems to the company's reach. Down the line, it could cue an era of increasingly uncanny ad targeting, in line with the infamous example of Target analyzing a teenager's purchasing habits to deduce she was pregnant. Signing into several sites with the one log-in can leave accounts as vulnerable as the one with the lowest security. So-called daisy-chained accounts can also make identity theft easier for would-be scammers. If a trusted source of your identity is less secure — whether that's Facebook, Google or another account — they risk becoming the weak link in the chain that gets targeted by attackers. There's also the possibility that less scrupulous sites may do something else with your data than what you agreed to — for example, selling it to a third or fourth company that you do not want holding any aspect of your online identity. Before you sign into a site with your existing social account, make sure your trust the third-party site. People use Facebook and Google log-in because it's easier than creating a new account. The benefits of sailing smoothly past log-ins and account registrations often mean we're happy to trade away some data privacy. Be aware that if you choose to log in with a social account, your data will be shared between the social network and the third-party app. Stay updated on your social networks' privacy policies, and use the social log-in accordingly at sites you feel comfortable sharing data with. Don't use your main account to log in to a site whose security you don't trust. Don't link a social profile to sensitive info like your Social Security number or financial details. In these cases, a separate account and password is your safest bet. The most secure use of social log-ins is with closely related sites. For example, Twitter's log-in works well with services it's integrated with its own ecosystem or where there's a benefit to being able to cross-post — say, between Wordpress and Twitter. Likewise, Facebook could be used for services such as Instagram, Facebook Apps or other third-party services that plug in to the Facebook platform. Oh my goodness I’ve been doing this but I must now resign myself to taking the time, when in another site, and if interested enough to register and sign in independently. It’s interesting that Techilicious had a Faceook login button. We never said that you shouldn’t use Facebook to sign into sites - it can be a very convenient way to do things - but you should be aware that it could be used by Facebook for ad targeting (like everything you do on Facebook). For those who feel uncomfortable with that, we offer a simple comment option on our site that doesn’t require logging in to Facebook. First I find ironic that these comments have the FB sign on option! But it’s an interesting article, possibly only stating the obvious though. I was curious about the possible repercussions of using social media organisations to sign on various sites. It certainly makes life easier as it can be a real pain as highlighted in your article, to sign on again another site and store another pw. It’s also interesting to see how so many people don’t seem to worry about it. Use their own name without a care. Talk about fairly personal things for all to see. I agree ordinary people probably don’t have need to be so cautious. However once in a while we hear disturbing stories resulting from such care free attitude. As stated, “it’s our choice” to use social media. And usually there are some privacy options one can chose from. I have a email address when I have a gmail address? ...if, in researching this article the author or her peeps found any details about facebook being able to delete emails in a persons gmail account. specifically emails that were generated by and recv’d from facebook. BUT I do not agree and have never agreed with any outside pty. having the authority to delete emails in MY account. is this somehow covered in the “Full Account Access” permissions that some sites require you to agree to when using them? If you get banned from Facebook, you will lose access to your accounts on all websites on which you logged in with Facebook. Gives me all the answers I was looking for. Thank you. If you mean our Facebook login for commenting on site, we’re having some issues with that. If you login via the Facebook button and it doesn’t show and you’re on Chrome, try hitting the button again or refreshing the page and it should show you as logged in. Need my facebook email address in order to login into an app used facebook for account creation but I can’t locate it. I think we could not use the other site for the login, those sites we can use which are more authentic site and more secure site. Google Chrome can also do this for you. If you have a gmail address than you have an email address, because gmail addresses are email addresses themselves (just ones hosted by Google instead of Yahoo or AOL or whatever). If someone’s requiring you to have *another* email address when you already have a gmail address, that requirement doesn’t make much sense. Why do you use Gmail? Dont you know that for years Google opened up and read EVERY email that they hosted? For God sakes, these A-hol@@s should be in jail! I know this article is old, but I can’t find any place to rant! I got rid of FB a long while back, as I was tired of it encroaching into my online life. Good thing too, because as it turns out, it’s a very, very bad site regarding privacy and so on. What steams my buns is…so many news sites and other interesting sites only have FB for commenting. THAT IS SO WRONG! I think there needs to be a movement of some type to INSIST that popular sites give people OPTIONS, other than Fascist Book. I need to know if I can trust Frank David my online courtship from him becoming retired military and proposing most eloquently to me. PLEASE I am a senior & have had a most tragic life. I just don’t want to be heartbroken anymore. Can you help. Me. I’ve tried everything else.